I am so excited to continue Birthday Week with a tutorial that will span over 3 days! I don’t know about YOUR house, but mine is FROZEN obsessed. We watched it on opening day and haven’t been able to stop singing along (and watching it over and over since it came out on DVD). 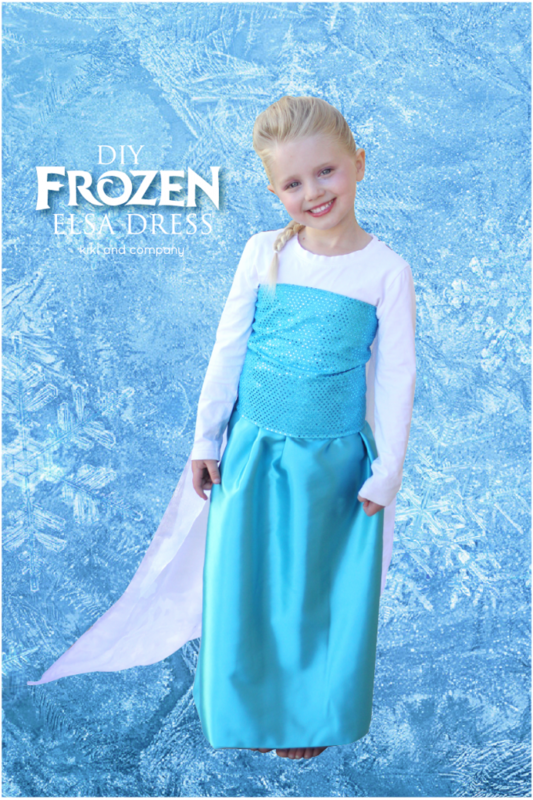 My daughter had a Frozen Birthday party to go to and was suppose to dress like someone from Frozen, so of course she picked Elsa..who else, right?! BUT TRUE STORY. I went to buy her a dress from the Disney Store. Out. I looked all over. Out. Disney is apparently sold out through June. I looked on Amazon and found one for $450. Umm, no. So we did not despair and packed up the kids and went to Hobby Lobby to shop for some fabric! There are some great shortcuts we took to make it look so great, but I can tell you she transformed and sang “Let It Go” the rest of the day. And the cape?! Well, she let me know at the beginning how long and beautiful it had to be. I also made it somewhat functional by making it removeable with velcro. For a smile that big though, I would do just about anything! She’s one of my little princesses and it is SO fun to let her imagine and imagine and imagine some more! Because it is Birthday Week, I thought you might want to join in on the fun as well. 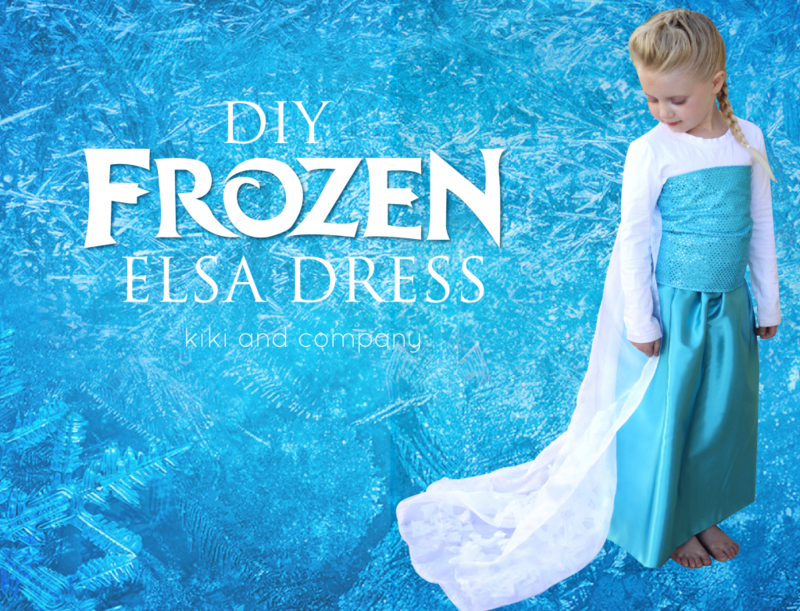 For just under $25 and a few hours you can make your own little Elsa her own dress and let her be the queen of your frozen castle. This will be broken up into 3 days, so by Friday, you will have all the steps to make your own dress! 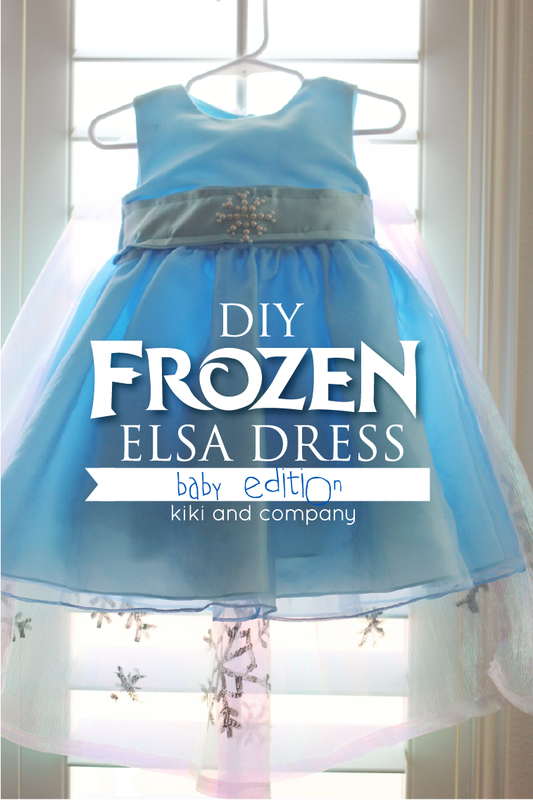 I’d love to see your little Elsa’s. Send me a pic to kikicreates at gmail dot com so I can see your handiwork! Too funny! 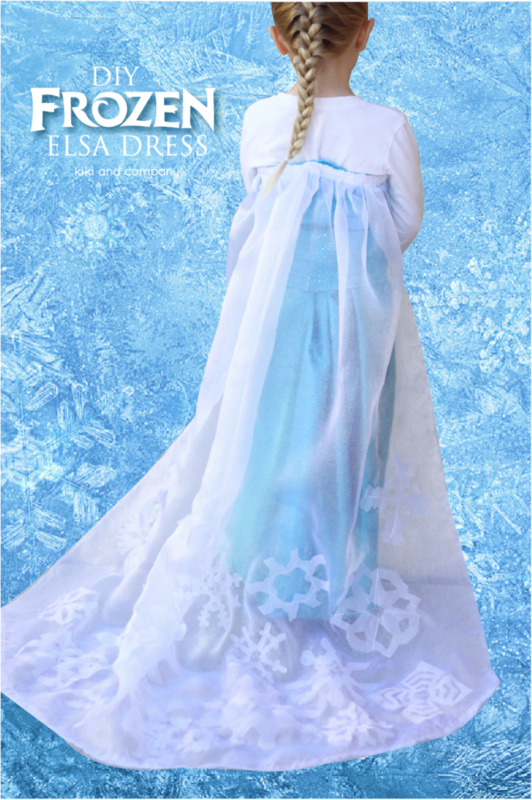 I just bought a bunch of fabric today to make my daughter an Elsa dress! Getting started on this early for Halloween! Thanks!!! I know, Meagan, Halloween will be here before we can blink our eyes! I just found this tutorial (and your page) on Pinterest. 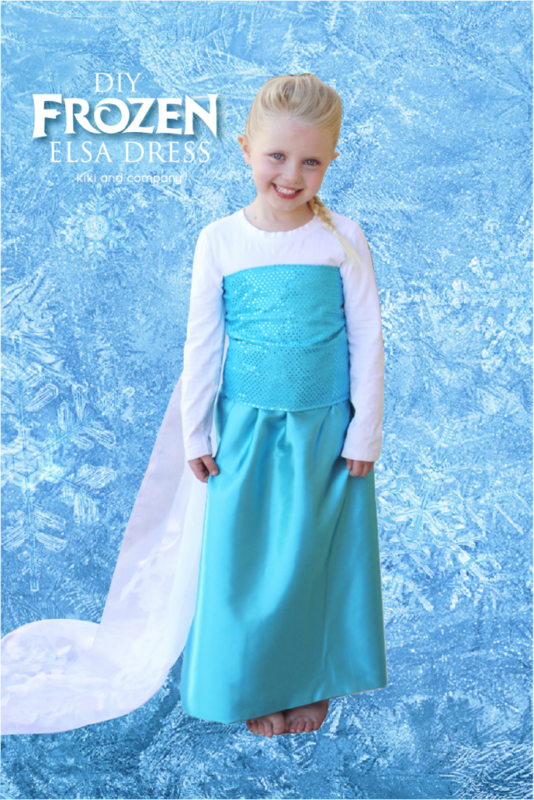 Your dress is beautiful and appears to be a very manageable version of the costume/dress! Having seen so many complex and over-the-top versions, It’s great to find something that I can start to understand (sewing-wise) just looking at it! Thank you so very much for posting your sew-along tutorial. I can’t wait to get started! I wanted to ask what kind of wonder under you got. There are SO many different kinds to choose from, and I’ve never used it before! I got the regular wonder under. this is the kind that you can iron on both sides. it is not too stiff, but helps give the fabric a good thickness. I got mine at Hobby Lobby, but you can find this at JoAnns, Walmart, etc. Thanks! I love how simple this dress is, but I do have a question. My daughter is 7, so she’ll probably have bigger measurements than your daughter. 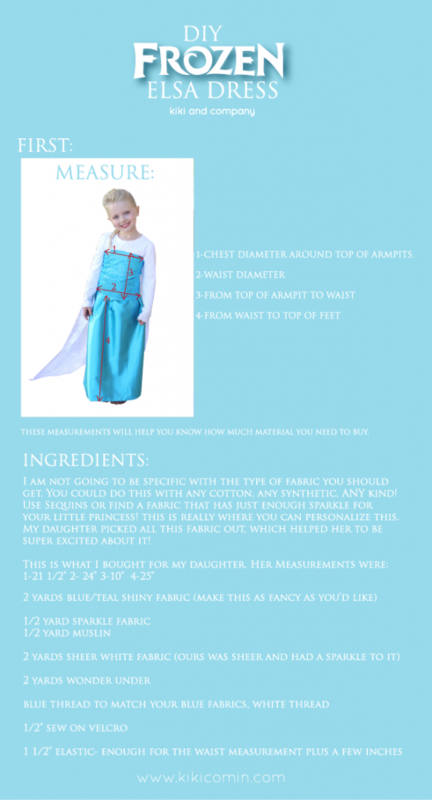 How did you use your daughter’s measurements to come up with how much fabric you needed? This probably seems like a silly question, but for the skirt, for example, you said that you got 2 yards of fabric, but after doubling your daughter’s waist measurement, you probably only needed 1 1/2 yards. I am just trying to figure where the extra 1/2 yard comes into play or if you got extra just in case. I just wanted to get a little more of an idea of how much fabric to get based off of the measurements. Other than that, everything seems very detailed. Thank you! yay, missy! Thanks for the feedback. You can send me a pic at kikicreates@gmail.com or upload it to my facebook page as well! Thanks so much!